So the first of my Awards reading list turns out to be Netherland. First for the simple reason that it was available in the library. (I never noticed until now how strange it feels to call a book ‘it’ and how engraved it’s in my mind a book should rightfully be referred to as a ‘she’.) Netherland won the 2009 PEN/Faulkner Award (and was nominated for a lot of other awards, including the Booker). 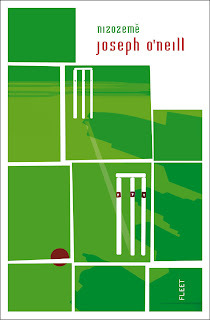 And it really is almost unbelievingly compelling – considering it’s about cricket (and I thought at first the image on the cover was just some weird optical illusion stuff..), marital problems, cricket, world after 9/11, cricket… and considering it’s me reading it. I probably can’t fully appreciate this book, because I’m too young (my mom wouldn’t believe I said that! I almost don’t believe it myself) and marriage really is just a distant concept (and let it stay that way for some time longer, thank you very much). But I still enjoyed the ride, in this case more like a languid cruise of ‘I don’t know what to do now, so I’ll just go with the flow and see what happens’. The narrator of the book is Hans van den Broek, a Dutch stockbroker (yeah, I had to look this word up at wiki). He moves to New York with his British wife Rachel (and their soon-to-be-born-baby) some time before 2001. Everything seems to be fine, but after the september attacks, his wife decides to return to safer London - without Hans. Apart from Chuck and cricket, Hans fills his time with occasional visits to London, business trips and the hotel he stays in - a collection of misfits and weirdos. It was a scene in the hotel that made me realize I never really thought about how 9/11 could have changed the lives of ordinary people in New York - there is a blackout and immediately people start to panic and try to get away from the city. After some time, (a few years I think it was) Hans and Rachel manage to repair their marriage and live in London. And when Hans learns that Chuck was found dead in a river, he starts to reminisce and tries to find out what happened, but to no avail. Oh, and as usual, one 'normal' review, just to be sure...:) This time from guardian.co.uk.